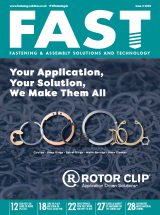 FAST (Fastening & Assembly Solutions And Technology) Magazine – the UK’s ONLY journal dedicated 100% to the subject of fastening, bonding and assembly in manufacturing applications. To receive hard copies of FAST magazine for FREE, subscribe here. Or, sign up to the FAST newsletter.